Nothing says pride season like crass commercialization. Companies from around the world launch queer-themed merchandise and soak up the dollars. We’ve already covered Nike’s new rainbow sneakers and American Apparel’s t-shirt that not only says the word “gay,” but knocks Donald Trump. 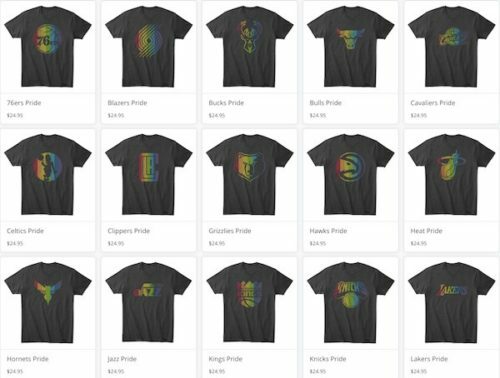 Now the NBA is getting in on the action with a new line of t-shirts featuring your favorite basketball team’s logo in rainbow colors. Get out your wallets! Meanwhile, the private prison industry is funding most of our largest LGBT organizations. And guess who’s getting kickbacks from American Apparel and the NBA? Yup. Queer organizations (HRC and GLSEN respectively). But look the other way when your reach for your pocketbook and ignore the blatant hypocrisy of civil rights organizations raising cash off of the back of impoverished children working for slave wages in garment factories in China (Nike), Bangladesh (American Apparel), and Nicaragua (Teespring/NBA). HRC supports employment nondiscrimination laws, but doesn’t care about LGBT being actively discriminated against while making their t-shirts, hats and tote bags. GLSEN supports LGBT youth, but not the ones making tank tops for them. And both of them rake in big bucks from Wells Fargo, one of the largest investors in all three of the for-profit prison and detention companies in the U.S., who profits the most by continuing the school-to-prison pipeline and the mass incarcerations of LGBT people – especially transgender women of color. They say you can’t have a revolution without spilling a little blood. So while you pick out your 2016 pride gear, take a moment and realize that the cheap foreign-made merchandise you’re forking over big bucks to own is soaking in it. It’s just not yours. But, hey. Cool shirt, bro.